Home > Blog > Does Coal Always Mean Water Stress Along With Economic Growth? By adopting water conservation technologies, water saved in the agriculture sector can be transferred to the coal sector, however, with high cost. Photo by Yuan Wang. 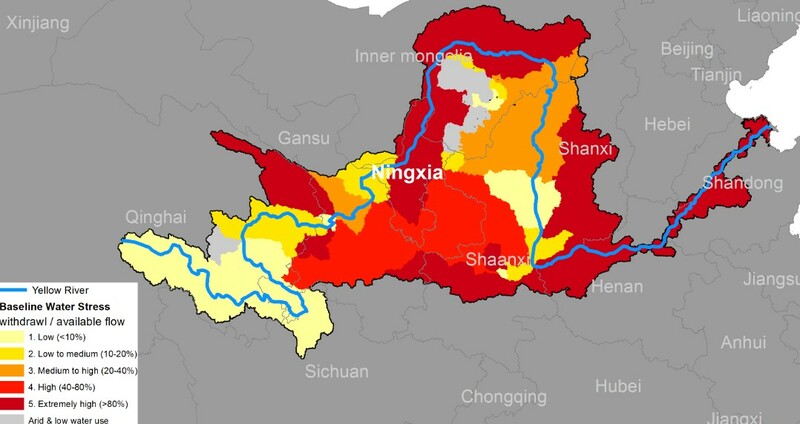 Ningxia is one of the most water-stressed regions in China, with per capita water resources just 30 percent of the national average and over 70 percent of the land subjected to high to extremely high water stress, according to WRI’s Aqueduct Water Risk Atlas (see Figure 1). Although Ningxia is one of the smallest provinces in China, it is home to one of China’s largest coal bases, Ningdong Energy and Chemical Industry Base (“Ningdong base” below). Coal production and power generation has driven Ningxia’s economy over the past decade. However, as an extremely thirsty industry, coal has put more stress on the area’s water supply and heightened competition with other users, including farms and households. A WRI working paper recommends developing a coordinated system to ensure sustainable development of water and economy in Ningxia. Baseline Water Stress: measures total annual water withdrawals (municipal, industrial, and agricultural) expressed as a percent of the total annual available flow. Ningxia’s coal industry made up about 50 percent of total industrial production in 2012 and helped drive a tripling of GDP per capita between 2005 and 2012. 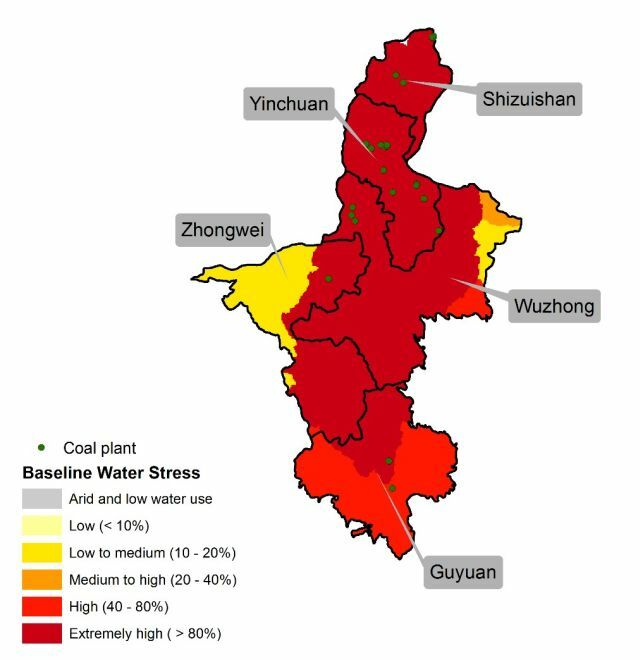 However, such rapid coal development exacerbated water stress. By the end of 2012, 91.5 percent of installed power capacity of Ningxia’s coal fired power plants was in areas with acute water shortage (see Figure 2). Even though power plants using air cooling technologies, which help to reduce water consumption, accounted for 62.8 percent of the total installed capacity, new planned coal-fired power plants will still increase water demand (see Figure 2). Estimated by WRI, water consumption will rise 1.5 times by 2015 and double by 2020 compared to 2010 levels if coal fired power generation targets are met at the Ningdong base. Ningxia has 5 prefecture-level cities: Yinchuan, Shizuishan, Zhongwei, Wuzhong and Guyuan which are shown in Figure 2. Ningxia provincial governments has adopted policy and economic measures to meet the coal industry’s demand for water, including water conservation, water rights transfer and water pricing measures. Increased investment in water-saving technologies cut Ningxia’s water consumption per 10,000 yuan of GDP by 77 percent and industrial water consumption per 10,000 yuan industrial value added by 68 percent from 2004 to 2012. During the same period, about 88 million cubic meters of water were transferred to nine coal projects through water right transfers. However, these measures’ effectiveness can be further improved, especially through investments the efficiency of agricultural water use. Agriculture accounts for 90 percent of Ningxia’s total water withdrawal, most of it flood irrigation, but the agricultural water use efficiency is 6 percent lower than even the national average. The government has proposed transferring water from agriculture to coal production, but it is only possible in a limited way given the existing infrastructure of canals. At the same time, funding is limited and farmers are not able to move to water-saving farming methods without additional resources. Meanwhile, Ningxia’s current water rates and water resources fees are too low to reflect the real value of water, weakening incentives to conserve this vital resource. In addition, current policies treat water and energy as separate elements in Ningxia, not recognizing that they are inextricably linked. Recognizing that water is a finite resource and needs to be seriously considered when planning coal development. Given water’s scarcity and the growing demand for it from cities and industries and for food production, it makes sense to increase non-coal energy and energy efficiency investments. Improving agricultural water efficiency. Our analysis estimated 0.34 billion cubic meters of water could be saved by increasing agriculture water use efficiency from 45 percent (Ningxia 2012 value) to 51 percent (China 2012 value). Even apart from how much coal development occurs, inefficient agricultural water is needed for other sectors and to support Ningxia’s growing economy. Developing a robust water rights allocation and trading system between companies and farmers or within companies with safeguards to protect farmers but also promote more efficient water use. Accelerating water price reform, raising water resources fees and exploiting price leverage to encourage conservation. Setting up a system of eco-compensation for the coal and mining sector -- using incentives, such as subsidies and tax exemptions, and policy supports to encourage the mining industry to protect and restore natural areas that can improve water quality and water supplies.